Make no mistake about it, for the Democrats to win control of the Senate, which now stands at 51-49 in favor of the Republicans, is as likely as drawing to an inside straight. Possible, but highly unlikely. There are 35 Senate seats up for grabs, 33 regular Senate elections and two special elections. Democrats are defending 24 of those 35 seats. If those numbers were not problematic enough, it is where those seats are that is the biggest concern for Democrats. Montana, West Virginia, North Dakota, Missouri, and Indiana, all states Donald Trump handily won, have Democratic Senators running for re-election. Recent polling though suggests Democrats' odds of winning the Senate are increasing, albeit still long. 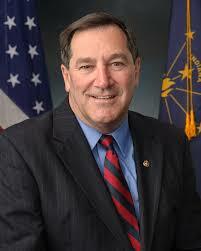 Yesterday, Gravis released a poll showing Indiana Senator Joe Donnelly trouncing the potential Republican nominees by double figures, i.e. Congressman Todd Rokita by 18 points, and Congressman Luke Messer by 10. It does not appear that Gravis bothered to poll a general matchup with the third candidate in the GOP race, State Representative and businessman Mike Braun, which was a mistake as Braun polled as being in the lead for the GOP nomination with 26%. Rokita was second at 16% and Messer trailed the filed at 13% in the primary matchup. I believe, in the end, the nominee will be Braun or Rokita, but I believe Donnelly will win the general election by a small, but comfortable margin. Braun and Rokita, and to a lesser degree Messer, are competing to appear the Trumpiest, but I think that designation will be an albatross around the winner's neckl in the general election. Trump is not popular in the Indianapolis suburbs, particularly in Hamilton County, and those suburbs, which allow the Democratic strongholds of Marion and Lake County to be more than offset, are critical to the fortune of GOP statewide candidates. Then you have West Virginia. While the Democrats have a strong candidate in Joe Manchin running for re-election, Trump did win the state by over 42 points and remains popular there. It was bad enough that Manchin was shown leading a potential GOP rival, West Virginia Attorney General Patrick Morrissey last November by over 20 points, it appears the Republicans may instead nominate Don Blankenship, a mining executive who was convicted of a felony for skirting regulations that could have prevented a mine explosion that killed 29 of Blankenship's workers. Meanwhile, as to seats the Republicans are defending, it looks like my prediction that the Democrats have a real shot at winning Texas are being reflected in the polls. A Quinnipiac poll issued yesterday showed incumbent Senator Ted Cruz clinging to only a 3 point, 47-44, lead over Democratic nominee Congressman Beto O'Rourke. O'Rourke is also badly swamping Cruz in fundraising. Then you have Tennessee, a state Trump won by 26 points. In the Volunteer State, Republicans are defending a seat currently held by Bob Corker, a Trump critic, who has decided to not seek re-election. Trump enthusiast Congresswoman Marsha Blackburn has stepped into the void, but the Republican trails by 10 points former Democratic Tennessee Governor Phil Bredesen. Democrats also have a better than 50-50 chance of winning Republican seats in Nevada and Arizona, but will struggle to defend against Republican challengers in Missouri and Florida. Yes, it is still a longshot for Democrats to gain control of the U.S. Senate, but it is now more plausible. Donnelly is basically a Republican anyway, don't know why this election even matters. Donnelly is basically a Republican anyway. Agree he is a DINO.